Tunnel Canyon Overlook is located along the South Rim Drive in the Canyon de Chelly National Monument near Chinle, Arizona. The location is one of seven overlooks that are spread out along the south rim of the monument. It is also a good place to stop if you are looking to acquire some authentic Navajo crafted goods. It is 2 miles to the Tunnel Canyon Overlook along the South Rim Drive, Indian Route 7, measuring from its intersection with the North Rim Drive near the Visitor Center. The short trail to the overlook begins on the righthand side of the parking area. The trail itself is hard packed with some uneven slickrock. The general public is only allowed to go as far as the fenced area. If you want to go down the steps and into the canyon you will need to hire an authorized guide to take you. A quick web search will turn up lists of authorized guides. 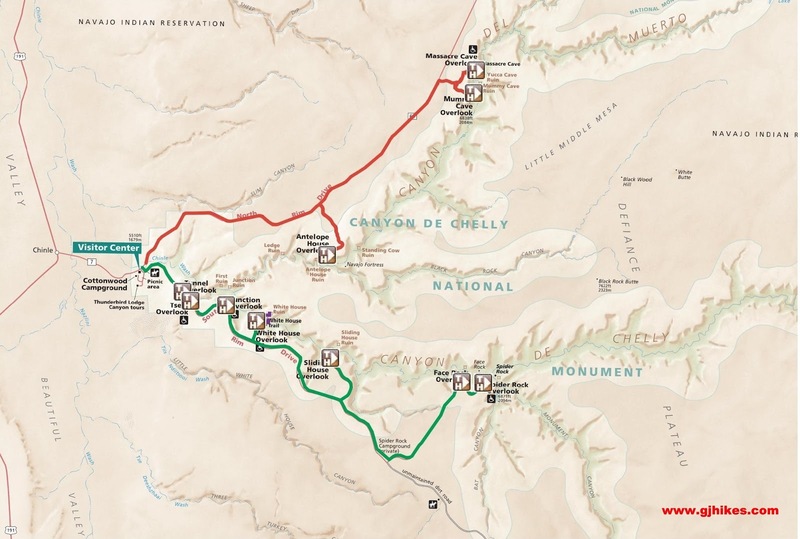 Fees generally depend on the trail and how long you will be in the canyon. From this vantage point all you can see is a small portion of the valley below where cottonwoods and russian olives are thriving thanks to the water provided by Chinle Wash. The tall monolith that can be seen standing across the wash is called 'Sleeping Duck'. Tunnel Canyon is hidden behind it just out of view in this photo. We were able to purchase several very attractive painted sandstone motifs from one of the Navajo vendors at the parking lot at a very reasonable price. The prices from these roadside vendors are usually considerably less than what you might pay in most trading posts so we always look forward to perusing their wares. The Navajo, or Di'neh, are very gifted craftsmen that pass their unique styles down from generation to generation. As far as the Tunnel Canyon Overlook goes, if you would like to see it for yourself then all you have to do is 'Take a hike'.